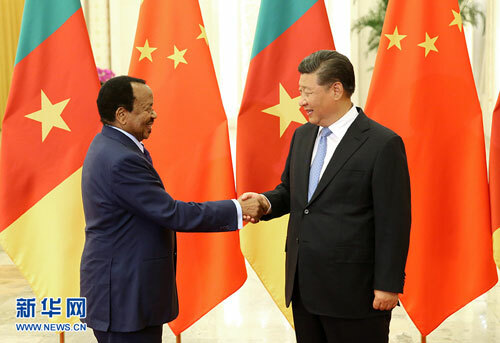 BEIJING, Aug. 31,Chinese President Xi Jinping on Friday met with Cameroonian President Paul Biya ahead of the 2018 Beijing Summit of the Forum on China-Africa Cooperation (FOCAC). Xi pointed out that since Biya's visit to China in March, both sides have been actively implementing the consensus reached between the presidents, bringing new achievements in exchanges and cooperations in various areas. China is ready to maintain high-level communication with Cameroon and see that the two countries continue to support each other on issues of core interests and major concerns, said Xi. Xi also pledged to strengthen cooperation in infrastructure construction, and contribute to the industrialization and modernization of Cameroon under the framework of the Belt and Road Initiative and FOCAC. "China will support Cameroon in enhancing its capacity to maintain peace and stability," said Xi. Noting the solid traditional friendship between the two countries, Biya expressed compliments on the vision of a community with a shared future for humanity and the Belt and Road Initiative, both proposed by Xi. The Cameroonian president also expressed his gratitude for China's long-term support, and willingness to deepen bilateral cooperation. The 2018 Beijing summit provides an important opportunity for the common development of African countries and China, said Biya, adding that Cameroon will work with China to promote the China-Africa comprehensive strategic and cooperative partnership.